It comes as a surprise, or rather the sad truth, that the once extremely popular Les Petits Chats, the Egyptian band whose concerts saw roaring crowds and swooning ladies, is now forgotten, together with a large chunk of Egypt’s cultural history. Though it is still popular with the generation that witnessed its rise in the 1970s, today the name Les Petits Chats rarely rings a bell among the youngest breed of music lovers. The band had a famed reunion at Palm Hills compound in the satellite city of Sheikh Zayed, Egypt in 2009, followed by the Les Petits Chats Singers concert at the Bibliotheca Alexandrina last year, but while they continue to touch the hearts of older listeners, they only raise the eyebrows of the young. Sherif Nakhla, a filmmaker, decided to embark on a journey to uncover the riches of Egypt’s cultural golden age. His odyssey has resulted in Les Petits Chats, a rockumentary that brings back to today’s audiences the lost romantic feel of the band and their time. After six years of work, finally, the film will have its world premiere at the Arabian Sights Film Festival in Washington DC in mid-October. Nakhla double majored in theatre and journalism at the American University in Cairo, graduating in 2002. He practiced cultural journalism for a few years, writing for platforms such as Al-Ahram Weekly. But his directorial repertoire now comprises numerous stage productions and the film Miraculum (2007), which won Best Socio-Political Documentary at the New York International Independent Film & Video Festival as well as an Achievement Award at the Newport Beach Film Festival. Nakhla’s dynamic biography also points to a close attachment to music: he was a member of the Mercury rock and roll band, he plays drums and guitar and works as a DJ in various venues. It was this combination of interests with a focus on film, “a sector that remains closest to my heart,” as Naklha puts it, is what drew his attention to Les Petits Chats. Les Petits Chats is probably Egypt’s best known cover band of all time. 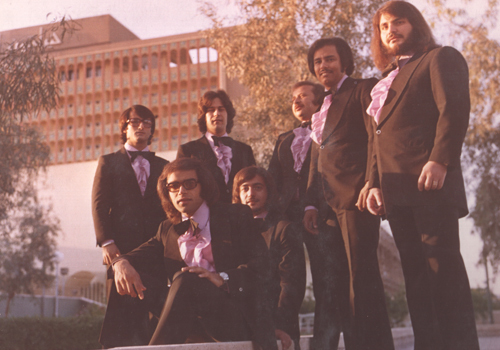 Launched in 1967 as a quintet, the band included vocalist and band manager Wagdi Francis, alongside Ezzat Abou Ouf on keyboards, Omar Khairat on drums, and guitarists Freddy Rizk and Bert Andresia. 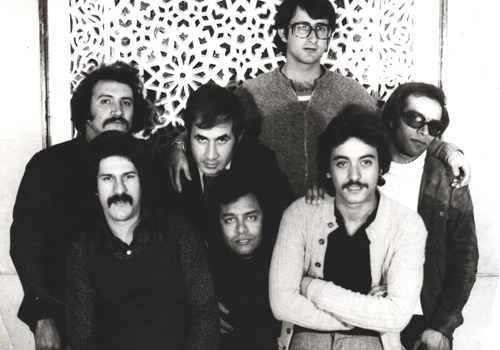 Through the years, the lineup changed many times, incorporating names such as saxophonist Lukas, singers Sobhi Bidair, Talaat Zein and Hussein Serag Rady, keyboardists Hany Shenouda and Hany Meimary, guitarists Omar Khorshid and Pino Phares, among others. As their popularity soared, concerts across Egypt were soon supplemented with regional appearances to constant acclaim. “The band is our cultural heritage. They are not just Les Petits Chats, they are icons of the time,” Nakhla comments. He goes on to explain how his work on the film began in 2009 when the band was preparing for their reunion. “It was this whole Les Petits Chats phenomenon that hit me in the face, and immediately I felt the need to investigate it further,” he says, explaining that he could not skip noticing that whenever the name of Les Petits Chats was mentioned, it created excitement among the generation whose youth was embedded in the Egypt of the 1960s and 1970s. Nakhla points to each of Les Petits Chats’s members becoming a significant figure in his respective field. Though the young generation may not know Les Petits Chats, they are well aware of composer Omar Khairat, actor Ezzat Abou Ouf, tenor Sobhi Bidair, and the late musician Omar Khorshid. Nakhla calls Les Petits Chats “our national pride,” saying that it is through the band that his film presents the Egypt that used to be. Yet it took the young director six years to make the movie. By the end of 2009 Nakhla had all the ingredients for a film, and this is when he decided not to make a conventional one. But the film production did not go smoothly. In the following months, and years, Nakhla was engaged in different projects, going back and forth with Les Petits Chats. The progress was interrupted again by the 2011 revolution, and though at certain point Nakhla felt he had reached first-draft stage, the constantly changing political backdrop raised questions regarding priorities. Finally Nakhla went back to his core idea of creating a film about Les Petits Chats against the backdrop of their own time. “I am very happy with this decision,” he says. “The only regret I have is that Lukas passed away and was not able to see the film released.” Apart from all the delays, the film was “made with tears” and involved many emotional aspects. The film includes several interviews with the band members, alongside other personalities who serve as commentators on the era. “I preferred to step back and not to introduce any narrator, leaving the whole film to the band members. I think this is my favourite take on documentary filmmaking,” he explains. With the film’s soundtrack incorporating Les Petits Chats archival material and their rehearsals in 2009, the band’s story is additionally intertwined with photographs showcasing their history and that of Egypt. The viewer walks out of the screening with a deeper understanding of the two decades that enveloped Les Petits Chats’s stardom. Though the film was already screened in 2012 as work in progress during the Ismailia Film Festival and its final version shown as part of the Zawya art house segment of Oshtoora, a music festival that took place in South Sinai between 10 and 12 April this year, it is the the 20th Arabian Sights Film Festival release in Washington DC that Nakhla considers to be the world premiere. The film is nominated for a jury award, competing with Eyes of a Thief (Palestine), I am Nojoom, Age 10 and Divorced (France/Yemen/UAE) and Zinzana (UAE). Nakhla underlines that standing alongside such important movies is a humbling experience. He adds that he hopes to screen the film to a large audience in Egypt in November or December this year. The release of the film will be accompanied by memorabilia in the form of a package including a DVD of the movie, a coffee-table book of photos and copies of articles about the band, and a CD of their 1971 concert with the voices of Wagdi Francis and Sobhi Bidair, Omar Khairat on drums, Hany Shenouna on keyboards and Pino Phares on lead guitar. “It is an entertainment movie yet also a story of hope,” Nakhla says. While for those who were young back in the day, the film will be an emotional experience, for today’s younger viewers it will be an introduction to the band and the now distant culture of their country. Nakhla points to the peak of Les Petits Chats’ popularity, when the band was giving two concerts per week for years on end, thrilling crowds of over 5,000 people.